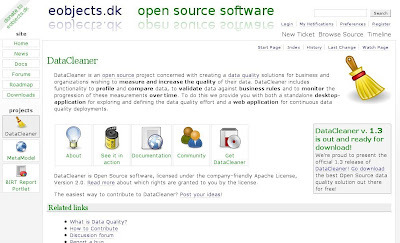 I'm anticipating the release of a new eobjects.dk website design. The website will be launched pretty soon I hope - we're doing it as a part of a general server move. The move is to the laboratory at Copenhagen Business School (CBS) called Business of Open Source Software and Standards (BOSSS). With BOSSS we'll have a much better bandwidth and a better performing server as well as better physical security conditions. Better theming engine has enabled us to use a more flexible website design with wiki pages appearing as menu items. A whole new news page which will be used to perform announcements on the progress of our projects. A lot of other improvements caused by the trac upgrade.